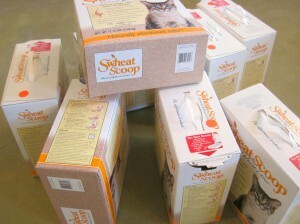 Lots of Clean Kitty Litter Boxes…. 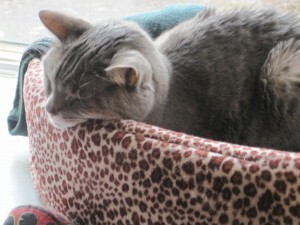 Our Puss-puss kitty simply MUST have new litter……… often……….. Yes, she runs our household (or rules it anyway). Do you see why we’re at her beck and call?? Anyway, the size and stability of the box seemed just too perfect for a new tote bag. I use mine to organize stuff in my car – it’s great because I can put a travel mug in there and it stands up straight (as long as it’s top is in the “closed” position, it works!). I have a few of them up on my etsy site (www.etsy.com/shop/pixiedustoriginal) for sale and will be sharing the step by step instructions in the coming days for those of you who would like to make your own. 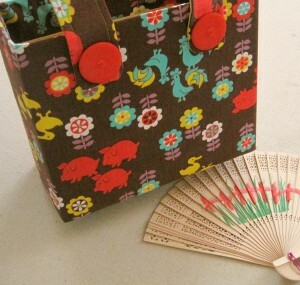 These new bags are my “heat wave” bags…… and include sandalwood hand fans in each! Smart, n’est pas?